Using the Atacama Large Millimeter/submillimeter Array, a team of scientists captured a detailed image of high-density molecular gas around an active supermassive black hole at the center of galaxy NGC 1097. An international research team led by Takuma Izumi, a second-year master’s student of science at the University of Tokyo, and Kotaro Kohno, a professor at the University of Tokyo, successfully captured a detailed image of high-density molecular gas around an active supermassive black hole at the center of a galaxy called NGC 1097 at the highest sensitivity ever achieved. The observation result shows that there is a unique chemical composition characterized by enhancement of hydrogen cyanide (HCN) around the black hole, which would be caused by high temperature heating of the environment surrounding the black hole. It is expected that this new method focusing on the difference of emission frequencies from molecules uniquely found around black holes may open the way for “the search for a hidden black hole” which is overcast with dust particles and optically invisible. With recent advancement in observational research, it has been revealed that many of galaxies contain a supermassive black hole (*1) at their centers. However, the formation process of such massive black holes is yet to be discovered by modern astronomy. A study result shows that the mass of a supermassive black hole is approximately proportional to that of the central part of the galaxy (galactic bulge). This means that the higher mass galaxy has a higher mass black hole. A galactic bulge is thought to evolve through numerous mergers and collisions with other galaxies which would bring a large amount of interstellar materials (*2) into a galactic center and further the evolution of a black hole. To investigate this “coevolution” of a galaxy and a black hole, it is necessary to study the mass of black holes in all ages as well as the kinematics of surrounding interstellar molecules that flow into the black hole. However, the first thing we need to do is to confirm the existence of a black hole at the galactic center by observation. A number of similar black hole exploration methods have also been proposed in optical/infrared spectra so far, but one crucial problem is that emissions at these wavelengths are absorbed by interstellar dust particles although the more active black holes contain more dust particles. This means conventional exploration methods have difficulty in finding a black hole during the most active stage of its evolution process. The goal of the research group is to establish a new exploration method using as reference various molecular/atomic emission lines which can be observed at millimeter/submillimeter wavelengths (*3). Millimeter/submillimeter waves are the most basic and most important wavelengths in observing interstellar molecules or more specifically cold high density gas, and thus suitable for the observation of the galactic center due to its very unique characteristic of being not susceptible to dust absorption. With the advancement of the study of interstellar chemical model in recent years, it is assumed that each of galactic phenomena (e.g. supermassive black hole, bursts of star formation, etc.) would have different impact on interstellar materials. The idea of the new method is to take these differences observed in interstellar materials as useful reference to identify the relevant galactic phenomenon. For the development and verification of a new method, it would be better to select a nearby galaxy which can be spatially resolved and examined in detail compared to a distant galaxy whose properties are largely unknown. 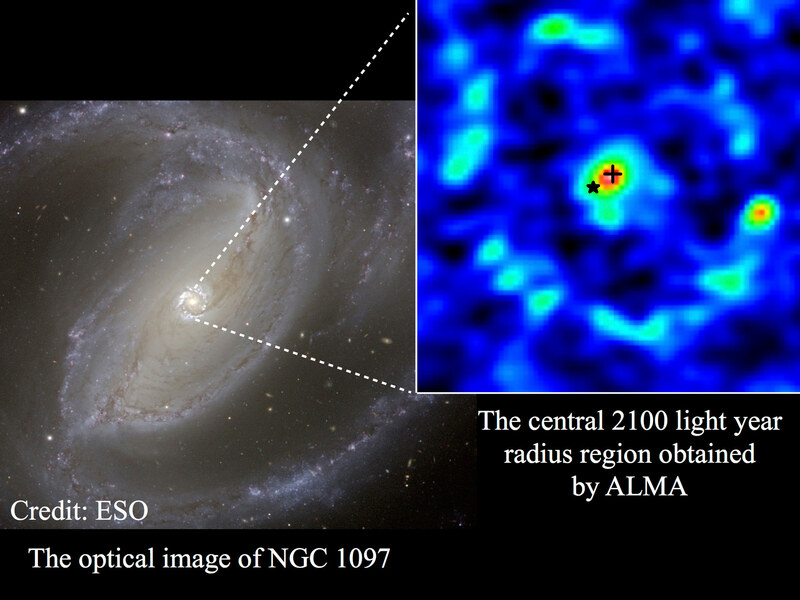 Therefore, the research group targeted molecular line emissions from hydrogen cyanide (HCN), formyl ion (HCO+), and hydrogen sulfide (CS) at millimeter/submillimeter wavelengths (*4) in the galaxy called NGC 1097 (about 50 million light years away) with the ALMA Telescope in the Atacama Desert in Chile. The observed molecular emission lines are suitable for the observation of high-density regions like a galactic center, and NGC 1097 is a galaxy that already proved to have an active supermassive black hole at its center by a preceding study. In spite of a relatively short observation for about 2 hours in total, low-noise, high-quality data was obtained at a high resolution of 1.5 arcsec. Figure 1 and Figure 2 shows the observed galactic center with a radius of 2100 light years and the spectra obtained at the galactic center respectively. With spectral data taken in a wide frequency range, we can obtain intensity ratio of various molecular line emissions. This spectral data indicates the intensity of HCN is significantly higher than those of HCO+ and CS. The similar phenomenon has been reported by observational researches of the surrounding environment of supermassive black holes at lower frequencies (millimeter wavelengths). Compared to the millimeter wavelength emission line, submillimeter is thought to be more suited to the observation of high-temperature, high-density regions, i.e. the environment around black holes. Thus, the results of this observation, similar to those of preceding research, confirm the validity of this research method. Figure 3 show the intensity ratio of molecules observed in other galaxies. 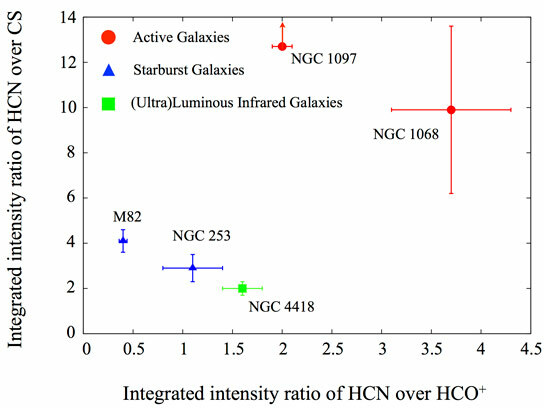 Although the data is limited only to a small number of target objects, Figure 3 shows the ratio of HCN/HCO+ and HCN/CS increases in galaxies that have a supermassive black hole in a more active state. This data can be used to identify what kind of phenomenon is taking place at the galactic center. The new identification method is based on molecular line emission at submillimeter wavelengths. Although the emission frequency of the more distant objects becomes lower due to the expansion of the universe, the ALMA Telescope is designed to receive millimeter waves in a frequency range lower than submillimeter waves observed this time, which means this identification method can be applied to objects even 10 billion light years away and will be a competent observation method in the ALMA Era when there will be a dramatic advancement in the research of distant galaxies. Furthermore, we examined physiochemical properties of the observed molecular lines such as temperature, density, and chemical composition of the emission regions by detailed analyses. The analysis result shows these molecular lines are emitted from high-temperature (several hundred degrees), high-density (about ten thousand to one million hydrogen molecules per cubic centimeter) regions where HCN molecules are actively generated. This result is thought to reflect the effect of a supermassive black hole, since it would be impossible to maintain such high-temperature state over the region of several hundred light years in general star forming activities. The observation data of NGC 1097 strongly indicates possible impact of shock wave heating by the jet which is ejected from the black hole. Similar model of HCN molecule generation in large amounts under high-temperature environment has also been assumed by recent study of interstellar chemistry. This research demonstrated that direct comparison of theory and observation is becoming possible by the ALMA Telescope with revolutionary resolution and sensitivity. This research revealed that the center of NGC 1097 contains highly-heated gas which would be related to the existence of a supermassive black hole, and the high-temperature gas induces the generation of HCN molecules. Focusing on this result, the research group developed a new exploration method of black holes by observations of molecular lines at submillimeter wavelengths. 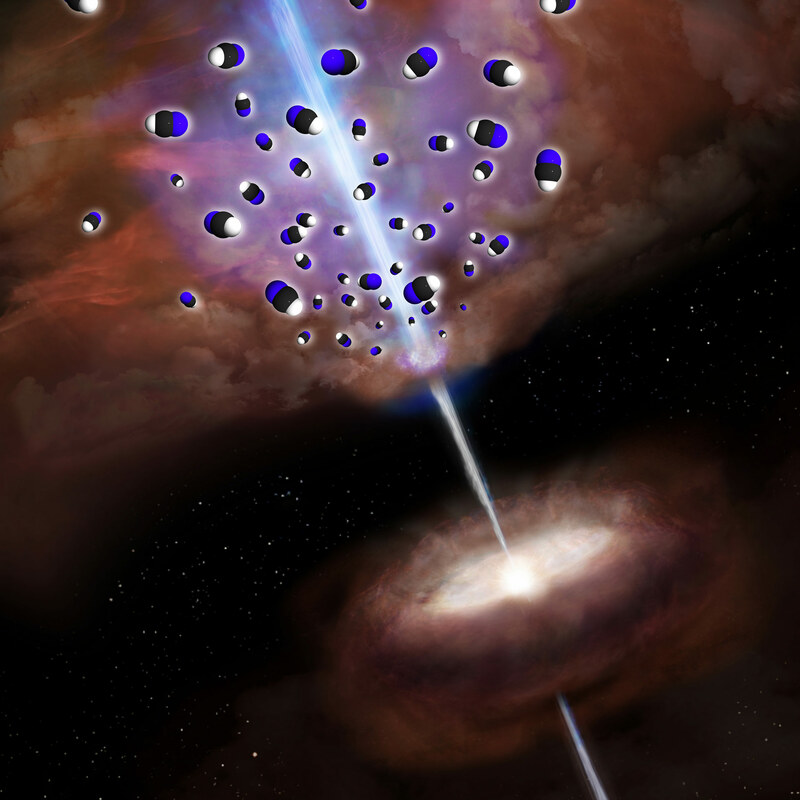 In the future, the research group will conduct verifications of this method by increasing the number of target objects and further detailed observations of high-density-gas with ALMA, aiming to explore the mysterious evolution process of black holes lying deep within the molecular clouds that cannot be reached by optical/infrared observations. (*1) A supermassive black hole has several million to several billion solar masses. (*2) Outer space is not a perfect vacuum. It is filled with gas and dust collectively called interstellar materials, which serve as “fuel” for black holes and star forming activities as important components of the universe. (*3) Millimeter and submillimeter waves are electromagnetic waves whose wavelengths are several mm and 0.1 to 1 mm respectively. (*4) Molecular rotation is described as discrete energy levels by quantum mechanics. When a molecule transits from a certain rotation state to another, it emits or absorbs electromagnetic waves that have energy equivalent to the difference of energy between the two states. Since the rotational transition is observed mostly in the electromagnetic spectrum at a different frequency corresponding to each molecule, it enables to identify what molecules exist from the frequencies of the observed spectra. Be the first to comment on "ALMA Observations Show Unique Chemical Composition Surrounding Supermassive Black Hole"